This is a great way to practice your cooking skills and become proficient in making delicious gluten-free meals. It's a real pain to look up new recipes every week or worse, get stuck in a rut of cooking the same meals week after week. Those services are great for mixing up your weekly eating routine, and helping you learn new skills! The list below highlights some of the many gluten-free services out there. I'm sure there are others as well. Keep reading to learn more about each service, plus a link to their website. Know of more? Leave a comment and let us know below! Also, you may want to check out our post about paleo meal delivery services because there's a lot of crossover between the two. In fact, any paleo meal will be naturally gluten-free. Some people prefer paleo as a way to promote health and weight loss. If nothing else, the approach is a different option, one that is worth considering. 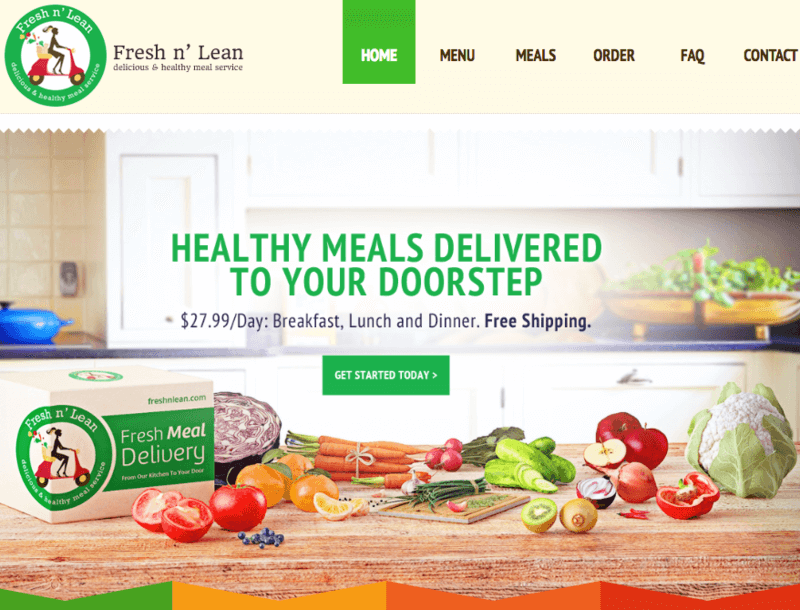 Fresh n' Lean delivers organic and gluten-free ready-to-eat meals right to your doorstep. Their offerings include low fat and low sodium options made using healthy and organic plant-based ingredients. You get a selection of cuisines ranging from Mediterranean, South American, Continental, and Asian. They have a rotating weekly menu, which means that you get a variety of different options to try out each week. There are also four menus to choose from, all of which are entirely gluten-free. The first two are ION Performance Protein + and ION Performance Paleo (Low-Carb). These both include meat and have an emphasis on performance. As such, they're high in protein. There is also the Standard Plant-Based Meal Plan and Low Carb/Low Cal Plant-Based Meal Plan. Both of those are vegan. The menus give you plenty of options and the food that the company prepares simply looks amazing. Fresh n' Lean offers four different meal plans to choose from and they all include very appealing meals. One of the disadvantages about their dishes is that they don't seem to have any raw ingredients included or fresh salad options. Their plant-based meal plans offer convenience at an affordable cost, with their standard daily package priced at $27.99 for three meals. They also have the option of one meal a day at $14.99, a lunch and dinner plan at $23.50 daily, and a custom A' la carte option. Best yet, they provide free shipping services. Since 2001, Healthy Chef Creations have delivered freshly prepared gourmet meals to doorsteps across America. They provide various meal plans and an A La Carte menu with weekly changes. Their food is all-natural without preservatives, artificial colors, or other additives. They also offer free-range and wild-caught meat dishes and incorporate fresh fruits and vegetables into the meals. With Healthy Chef Creations, it is as simple as creating an account, picking your preferred dishes, and choosing a delivery date to get your meals at your doorstep. One of the things that stands out about Healthy Chef Creations is that you can create sub-profiles for your family members/friends under your account. You can also customize the sub-profiles to include their allergies and food preferences. Healthy Chef Creations offers many different options and some interesting meals. They provide selections of vegetarian, low-carb, vegan, and gluten-free menu options. To make the selection process easier, you can pick one of their seven convenient meal programs. They include The Healthy Chef Diet, Healthy Mommy, Healthy Chef Sample, and Healthy Living Program with one, two, or three daily meal options. The price of their meals range from $32.99 to $47.99 per day, depending on the meal plan and how many meals you choose. For instance, they offer their Healthy chef Diet at $47.99, and it includes breakfast, lunch, dinner, snacks, dessert, side dishes, and their custom spa-energy detox drink. Many of the individual meals are around $15 for a regular size and $17 for a large. However, pricing varies depending on what you choose. 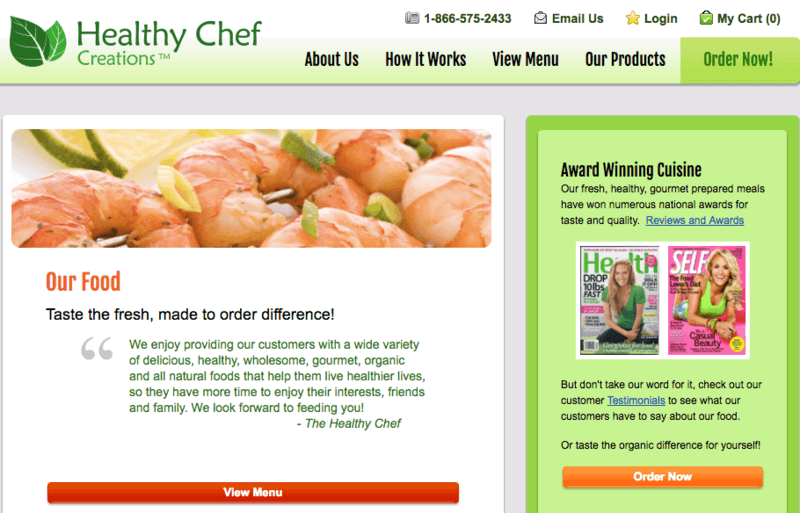 Healthy Chef Creations only delivers once a week, and shipping isn't free. Located in California, Magic Kitchen provides selections of quality chef-prepared meals. They deliver across the U.S, and you receive your food frozen. All you need to do is heat them up, and they are ready to eat in a matter of minutes. Of note, there is also a year-round Turkey Dinner delivery service, which is perfect for special occasions. Magic Kitchen caters for a wide range of dietary preferences, while still providing good food. It can get a bit challenging ordering from Magic Kitchen because they have so many different options, including A la Carte, bundles, and the meal programs. The programs are also tailored to the individual. To use one, you need to contact the company and discuss the best option for your needs. This can be frustrating but it gives you many more options than other styles. For example, you can focus on multiple requirements (including gluten free) and designate how many meals you want per day and per week. The average cost is $11 to $12 per meal, and they offer weekly price packages and discounts with their meal programs. Their shipping costs start at $18 and $20, depending on the delivery location. Compared to other meals services, their prices are relatively expensive and might be too much for families or seniors on fixed incomes. But, the prices aren't horrible either and there are many more expensive companies out there. Dave Rohde established Paleo on the Go in 2012, after he adopted the paleo lifestyle as a way to cope with several ailments including chronic fatigue. Their focus is on delivering meals that fit into the paleo Autoimmune Protocol (AIP) guidelines. The meals incorporate nutrient-dense, natural, and gluten-free foods to support the healing of the body. Borrowing from founder Dave's positive results after adopting the diet, they aim to help people with food sensitivities and autoimmune conditions cope with these ailments. The service has relationships with local farmers who provide the healthy, responsibly sourced ingredients used to whip up their range of paleo approved dishes. Their selection includes Full Menu items, the AIP Menu, Thanksgiving, Strict 30, Gift Certificates and Meal deals. The Strict 30 works as a 30-day reset program eliminating all grains, legumes, dairy, artificial sweeteners, and soy, while staying in line with the paleo principles. It is similar to the Whole30 diet in emphasis and style. Paleo on the Go has a good balance of meals and works well for anyone worried about immune reactions to food. You get your meals delivered to your doorstep packed in a cooler filled with dry ice ready to heat and eat. The price of their dishes varies vastly, with their Asian Fried Cauliflower Rice going for $5.50, Collard Greens with Smoky Bacon meal going for $8, and their Grass-fed Beef Brisket priced at $27.99 under their AIP menu. As a general estimate, many full meals are between $15 and $20, sides and soups are less expensive, and gourmet meals have a higher price tag. They have a Paleo on the Go rewards program, which earns you two points for every dollar spent. The meals service also provides bonus reward points days, product rewards Wednesdays, and review reward bonus points. The Schwan's brand is well-known for their delicious ice cream and grocery delivery services. Schwan's selection of food includes wild-caught seafood, flavorful fruits, fresh vegetables, USDA approved choice meats, and an array of desserts. They use only fresh ingredients to prepare their wide range of food options, which get to you in flash frozen packages. Schwan's doesn't focus entirely on gluten-free meals but they have a wide selection and are a convenient option. The meals service provides flexibility in delivery, and they do not have any set plans so that they can accommodate your changing weekly needs. Schwan's has a LiveSmart line that delivers selections of healthy alternatives, apart from their traditional chicken fingers, pizza, and tubs of ice cream. Through LiveSmart, they offer 80+ food options with varying levels of sodium, fat, and calories. All these foods contain zero trans fats. The line also caters to special diet needs with vegan, vegetarian, gluten-free, and heart-healthy options. The Schwan's Food Delivery app makes it easier to order on-the-go and get your meals wherever you want it. You can either have the food dropped off by a Schwan's sales rep or through the mail. Their prices range from $4.50 to $23.49 depending on the particular dish. If you happen to buy anything from their sales reps when they come calling on any other day, you might have to pay for shipping, even though you never ordered online. Popularized by Beyonce and Jay-z back in 2013, the 22 Days Nutrition is a vegan, soy-free, and gluten-free meals service. The company also relies on organic ingredients, leading to healthy meals all around. The premise of the meals service is that it takes 21 days to adopt a new habit and by the 22nd day it becomes part of your lifestyle. The delivery service provides three meal plans, which are four 5, 7, and 22 days. In each case, you can choose between two meals (lunch and dinner) or three meals (breakfast, lunch, and dinner) per day. There is also an A La Carte menu with weekly menu rotations, allowing you to sample their dishes before committing to a plan. You receive the food fresh; they do not freeze the meals, and the food comes ready to simply heat and eat. 22 Days Nutrition has some interesting plans and appealing meals. The chefs use globally inspired and innovative recipes to come up with their selections of plant-based meals, which means that the food is never boring. The only disadvantages are that they do not have family plans and there are no customizable meal plan options. The 5-day plan starts at $12.50 per meal, while the 7-day plan starts at $11.50 per meal and the 22-day plan at $9.50 per meal. These are the starting rates and the exact price per meal depends on whether you set up autoship and the specific options that you choose. The A la Carte meals are typically around $12.95 for dinners and around $6.95 for lunch. However, there is a minimum order of $75 and selection is limited. In fact, the A la Carte meals frequently sell out, so you need to get in quick. 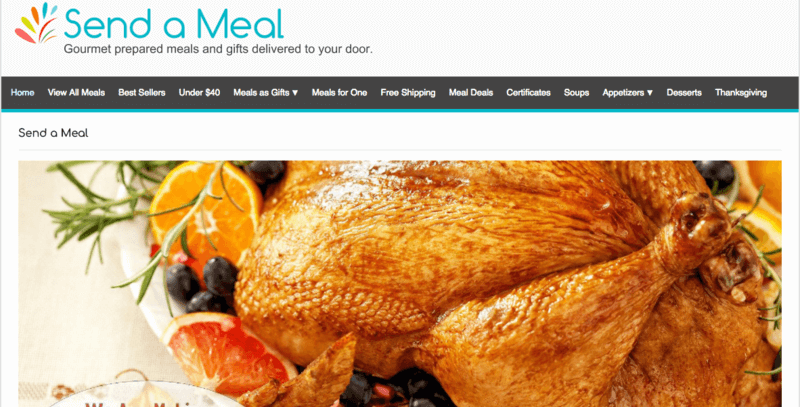 Mom's Meals is one of the go-to fresh meals delivery services that cater to seniors. They ship out nationwide, and their food can hold up for up to 14 days in your refrigerator without going bad. Your food comes stored in Fresh-Lock packages within a climate-controlled cooler. Medicaids recipients in 30 states can access Mom's Meals, but the food delivery service also has private pay programs. Their service is helpful for senior citizens, individuals with disabilities, and people living in rural areas who may not have access to a regular food supply. The food service offers special menu items including low sodium (heart-friendly), renal-friendly, diabetic-friendly, cancer support, vegetarian, pureed, and gluten-free meal options. As such, it's powerful for people facing complex dietary restrictions. Each of their meals has roughly 700 calories and includes grains, protein, vegetables, and snacks. It takes just about two minutes to heat up and serve the food. Mom's Meals caters for many different dietary needs and is an inexpensive service. Some of the issues with their site are that they don't have enough pictures or detailed descriptions for some of their meals. It would help to get nutritional information about each dish particularly those under their carb-controlled, low fat, low sodium, and gluten-free menus. Additionally, only some of the meals are gluten-free. There is a strong focus on cleaning, testing, and safety but the potential for cross-contamination does still exist. As such, it mightn't be the best choice for people very sensitive to gluten. With Mom's service, you have to order combinations of food in bundles of 7, 10, 14, or 21 meals. You can also choose combinations of either breakfast and lunch, dinner with breakfast, dinner with lunch, or all three every day. Their prices start at $6.99 per meal with $7.99 for pureed meal options. They charge a flat shipping fee of $14.95 for every order. Ice Age Meals delivers ready-to-eat frozen paleo dishes (well, mostly paleo). Only the meals that pass their testing period end up on their menu, and they currently have about 17 dishes. Their meals include Chipotle Turkey Chili, Lemon Pepper Chicken and Rice, Butternut Squash Lasagna, and Grass-fed Tri-Tip with Yams amongst other dishes. The only non-paleo ingredient they include is rice and that's only in a few meals. Thankfully, rice is gluten-free anyway, so the meals are all gluten-free. Ice Age Meals offers a selection of tasty frozen meals that are all gluten-free and are mostly paleo. They include delicious looking photos of their meals with information about the ingredients and nutrition facts included. All of their meals are under 1,000 calories with several under 500 calories, but the highest calorie dish is the Ribs ‘N' Sweets with Paleo Q sauce which has 910 calories. When ordering from Ice Age, you have to choose your preferred meals in quantities of 14, 24, or 48. You can Build a Box with combinations of your favorite meals or try out one of their samplers. Some people might find their meals a bit overly spicy, and most of their meals come loaded with tomatoes. However, that mightn't be a bad thing. After all, frozen meals are often on the bland side. Their Build a Box option lets you include your preferred Paleo meals in bundles of 14 meals at $174.99, 24 meals at $279.99, and 48 meals at $534,99. These average out at between $11.14 and $12.50 per meal, depending on the plan. They also offer a selection of six Paleo Grind spices including the Ga Ga Garlic Spice, Super Radical Rib Rub Spice, and Veggie Victory Spice. They sell the spices at $9.99 each with an option to get all six at $48.99. These are a fun way to add flavor to the frozen meals or to your own dishes. Anyone looking for a weight loss focused meals service should try BistroMD. Their programs use Dr. Cederquist's science for healthy weight loss guidelines with the convenience of ready-to-eat meals delivered right to your doorstep. You can choose between their 7-Day, 5-Day, or Custom programs. The 7-Day BistroMD program includes seven breakfasts, lunches, and six dinners. Their 5-Day program comes with five breakfasts, lunches, and dinners. With their custom program, you can create a personalized plan to suit your specific needs. They also offer a free diet analysis on their website. BistroMD mostly focuses on weight loss but they do have many gluten-free meals as well. One of the helpful aspects about bistroMD is their individualized support structured to help you through your diet journey. You can also choose between their standard, menopause, diabetic, and gluten-free options to suit your dietary needs. They ship out orders from Monday to Wednesday, and you can expect to receive your meals between Wednesday and Saturday. The schedule is a bit confusing because when signing up you might think that you will get your orders between Monday and Wednesday. The cost of their full program (7-Days with all meals) is $134.96 weekly. Their 5-Day plan costs $112.46 for the entire program. Their lunches and dinners plan costs $112.46 weekly with the 7-Day plan and $89.96 weekly under the 5-Day program. They offer a 25% discount and free shipping on your first order. The main limitation is that the company isn't exclusively gluten-free. This can create the potential for cross-contamination. However, that's only likely to be an issue if you are highly sensitive to gluten. Even then, the company has a strong focus on quality and is large-scale. Those aspects should lower the risk of any contamination. Siblings Elizabeth and Greg founded Trifecta to deliver fresh, organic, delicious, and nutritious meals. They offer selections of meal plans including Paleo, Classic Meals, Vegan, Vegetarian, and Clean Eating. Regardless of the plan, all of their meals are gluten-free and also don't contain soy or dairy. This allows you to choose whichever plan sounds the most appealing. Trifecta offers multiple types of meal plans and they are all gluten-free. The Paleo plan includes fish, meat, vegetables, and fruits. Their Clean Eating plan features healthy complex carbs, meat, fruits, fish, and vegetables. The vegan and vegetarian plans include veggies, beans, fruits, healthy complex carbs, and legumes. All of the plans are powerful for health and can help boost athletic performance as well. When ordering you can choose between one to four meals per day. They have an A la Carte menu, and all if their menus feature weekly changes. You can include details about your food allergies when checking out, and they will prepare your meals accordingly. Trifecta has one of the most flexible ordering options, and you can combine A la Carte menu items with orders under their different plans. Trifecta delivers throughout the U.S., including Hawaii and Alaska. Their flexibility extends to changing your delivery schedule, but you have to call their customer support to make these changes. They only deliver once a week, which is usually every Friday. Their Clean and Paleo meal plans start at $108.43 per week, their Classic plan from $119 per week, while their Vegetarian and Vegan plans are $113.90 weekly. Hungry Root brings tasty veggies to your plate through their all-natural, gluten-free vegan meals. Better still, they have selections of healthy, low-calorie, and nutrient-dense sides, spreads, and sweets. Each meal comes individually and conveniently packed, and you can enjoy your meal in seven minutes or less. You have the option of picking either their Starter Set or Good Life plan. The Starter Set includes three meals with two servings of each meal, four sides, sweets or snacks at $59 per week. Their Good Life plan comes packed with five meals with two servings of each meal, five sides, sweets or snacks at $79 per week. You can customize your delivery box to get the foods you prefer. Hungry Root mostly provides meal components but these are gluten-free and are very easy to combine. A few of their meals come with similar cooking instructions, which is not entirely a bad thing. Except for their cookie dough which needs 20 minutes in the oven, most of their meals are simple to prepare, typically taking less than seven minutes. This is the most unusual aspect of the company. Basically, you are sent the various individual components of a meal and need to put them together. The time and effort involved are still much less than with a meal kit, which is why the service was included in this list. Their meals can hold up for ten days after shipping. Hungry Root allows you to skip deliveries as you please and cancel your subscription when you want. They provide free shipping on orders above $40. Send a Meal is another unusual service. In this case, the company delivers gourmet meals, often in themed packages and as gifts. You can choose their five or seven-day plans with servings for two to four people. They also have meals for one, food deals, certificates, and desserts, not to mention many different packages of meals. Send A Meal's food packages includes the Special Occasions Meals that cater to birthdays, Thanksgiving, anniversaries, thank-you meals, and get-well meals. They also have Sampler meals including the Italian Sampler, Deluxe Sampler, and Sunday Supper. Their five and seven meal day plans are customizable. You can also choose specialty diet dishes including vegetarian, dairy-free, gluten-free, and low-fat meals. Sent a Meal mostly focuses on gifts but they have a wide range of different options to choose from. Expect for the steaks and lobsters; their meals arrive cooked and ready to eat. Heating instructions accompany the meals with most reheated in your oven for approximately 20 to 30 minutes. The price of their meals varies vastly depending on what you order. However, the cost of their five-day meal plan is $229.95, and their seven-day program is available for $279.95 per week. They have a same-day delivery option and Live Lobster gourmet meal service. They offer free ground shipping services with deliveries arriving in three to ten business days. Freshly delivers protein-loaded gourmet entrees and breakfasts. They offer dozens of dishes to choose every week with several vegetarian options too. Also, Freshly meals are gluten-free, and they make use of locally sourced produce and meat. Their entire facility is gluten-free, so the risk of cross-contamination is dramatically reduced. The meals do not require any cooking, and they come pre-portioned and ready to eat after heating. They also have selections of low carb and low calorie meals with most containing an average of 500 calories or less. The meals service has a weekly rotating menu with over 30 different recipes. Their meals get to you fresh in just two days with overnight shipping. Freshly offers reasonably priced meals and has multiple meal plans to choose from. The meals service does not offer vegan options making it a better choice for people who enjoy seafood and meat. Their breakfast offerings come with gluten-free oats and varieties of omelets. You can expect to find a Three Bean Turkey Chili, Lebanese-style Meatballs, and Herb-crusted Cod amongst their list of entrees. With Freshly, you get varieties of plans to suit your needs with the option of four, six, nine, or twelve meals each week. The cost per meal is $12.50 with their four meals per week option, $9.99 with their six and nine meals per week plans, and $8.99 with their twelve meal plan. They offer free shipping services. Unlike many of the other choices, Top Chef Meals doesn’t specialize in gluten-free meals. Instead, some of their dishes contain gluten and others don’t. However, the company does use wheat products in one part of their facility only, separate from the meal production aspect. This dramatically reduces the risk of contamination. The service offers multiple diet-based menus, including a gluten-free one, allowing you to quickly find meals that you can eat without a problem. They have a wide selection as well and allow for multiple dietary restrictions. Top Chef Meals support many diet types and even let you choose which individual sides and entrees you receive. An unusual aspect is the flexibility. With Top Chef Meals, you select an entrée, along with two sides. The entrée is the main component meal, such as Sliced Flank Steak or Baked Tilapia. The sides are two complementary components. Most of the time, one is a starch and the other a vegetable. There are multiple options for choose from for most meals. In some cases, you can also substitute so that you have two vegetable sides. The process means more to consider when you’re ordering a meal – but you can just go with the defaults. The style is great if you’re specific about the food you like. It also works well if you’re trying to keep to a certain macronutrient balance. The nutritional details are provided for the meal as a whole and also for each component. Individual meals vary in price but most of the basic meals are between $7 and $8. This includes options like Meat Lasagna, Lemon Ginger Turkey Meatballs, and Smothered Vegan Burgers. There are some more expensive dishes as well, including gourmet and premium lines. Finally, you can order meals in sets through the company’s Easy Order system. But, the price per meal remains mostly the same. Eatology is an interesting company, offering meals that are ‘clean eating friendly’. This mostly means they rely on whole food ingredients and fresh produce. The meals are all free from gluten, hormones and preservatives, while also avoiding added sugars. While that all sounds good, the same is true for many of the options on this list. Eatology also doesn’t specify where their food is sourced from or whether it is organic. The most unusual thing about the service is meal sizes. There are two main options here, classified as either 2B or 3B. The 2B meals contain approximately 14 grams of protein, 18 grams of carbs, 3 grams of fat and 155 calories. The 3B ones are larger, offering 21 grams of protein, 27 grams of carbs, 4.5 grams of fat and 232 calories. Eatology has two meal sizes and all of their food is gluten-free. There are also family platters, along with the ability to buy meals individually. If purchased on their own, the 2B meals cost $10.50 each and the 3B ones cost $12.75. The costs are roughly the same if you order in bulk. But, if you set up an auto order you can save 20% on the meal prices. For example, ten 2B meals costs $105 normally or $83 on subscription. The largest problem is their menu. The company offers few pictures of their meals, relying on brief descriptions instead. These give information about the name of the meal, the ingredients, and any allergens. But, that’s it. Not having any visual guide is a strike against the company – especially with so many gluten-free services out there. Once known as ModPALEO, The Good Kitchen is a practical and flexible option for healthy dinners. While the company no longer follows the paleo eating model, all of their meals are still free from gluten, soy, and processed sugar. There is also a strong emphasis on healthy ingredients. This includes a reliance on grass-fed pasteurized beef and pork, along with antibiotic- and hormone-free chicken. The flexibility with The Good Kitchen is amazing! The company offers a menu each week, typically containing 20 or more adults’ meals, along with 5 or so kids’ meals. The kids’ meals are basically healthy Lunchables, while the adults’ meals are similar to what other meal services offer. The Good Kitchen allows you to tailor your meal plans and choose the individual meals that you get. You can then pick which meals you want each week. But, be warned, some do sell out, so it’s best to make your choices early. The menu changes each week and the company will email a reminder to tell you to choose what you want. If you don’t, your weekly meals will be chosen by the company (which could be more appealing anyway). There are a few recommended plans to choose from. However, the main focus is that you build your own. You can choose anywhere from 5 meals per week (which costs $70 weekly) up to 35 meals per week (costing $385). Shipping is free in all cases. You can change the frequency too and opt to get the meals every week, every two weeks, every month, or just as a one-time order. All of the meals are provided in recyclable microwave-only BPA plastic trays. You can still reheat the meals in an oven instead, but you would need to transfer them to an oven-safe container first. The end result works well for many situations. Plus, the packaging takes up little space, so it is easy to freeze the meals. As a paleo food company, the dishes from Paleo Power Meals are all naturally gluten-free. The company also relies on high-quality ingredients. This includes relying on grass-fed beef, along with line-caught fish and free range poultry. Similar patterns occur for most paleo brands. But, if you’re wanting natural food, companies like this are the way to go. However, there are no details about whether the produce used is organic or not. Unlike many other options, Paleo Power Meals only lets you order meals individually. You can set up a recurring order but there are no set plans to choose from. The menu tends to be static as well, so the same choices are present from one week to the next. Thankfully, there are many meals available, including bulk items (e.g. 1 lb of ground beef), breakfasts, lunches, dinners, and sides. You can only order meals individually with Paleo Power Meals but there are still many interesting options. You’re buying the meals individually, so the prices vary depending on what you choose. For example, most of the dinners and the bulk options are between $12.95 and $14.95 per serving. The breakfasts and lunches vary more and cost anywhere from $5.95 to $13.95 depending on the meal you choose. Sides are either $5.95 or $6.95. You can also get discounts of up to 15% with a large enough serving size. Because the company focuses almost entirely on paleo meals (although, for some reason, they have a solitary side that isn’t), there should be little risk of gluten contamination. You also don’t need to worry about which meal you choose, as they’ll all be gluten-free. Even so, the company wouldn’t be our first choice. The site doesn’t seem as professional or refined as many of the other options. There are also key details missing and some of the food photography is poor, making the meals seem unappetizing. With so many other gluten-free options on this list, Paleo Power Meals just isn’t worth the effort. If you’re looking for transparency, Factor 75 is a very good company. They offer many details about their food, including the fact that all meals are organic and gluten-free. The company also has paleo, keto, and dairy-free meals, even though this isn’t their primary focus. The basic idea is that you sign up for a meal plan, which gives you anywhere from 4 to 18 meals per week, depending on the plan. You then select which meals you want from Factor 75’s menu. This menu contains 15 to 20 different meals and some of those change weekly. Factor 75 offers interesting meals with detailed information about each one. The meals themselves aren’t boring either. So, you’re not just looking at meat, potatoes and veggies. There are multiple styles, including some that are simple and others that are more complex. Examples include Butternut Squash Lasagna, Paleo BBQ Ribs, and Tostado Bake with Chili Jicama. Sound good? There is a ton of details for each meal as well. This includes a description, nutritional facts, and an ingredients list. There are also multiple photographs, including an image of the ingredients, one of the meal in its box and another of it served on the plate. This lets you know exactly what you’ll get before you order anything. Few other companies offer this style. The prices aren’t too bad either. The smallest plan is $60 for four meals each week (an average of $15 per meal). The largest is $198, which provides 18 meals a week (an average of $11 per meal). There are three others that fall in between those. There are cheaper services out there, of course. But, for gluten-free and organic, the pricing is reasonable. California Chef Services uses a different system than most other companies. They don’t offer a set menu or pre-prepared meals. Instead, meals are created for each customer individually. This allows you to specify multiple requirements for your meals. You can also highlight your food preferences and even the types of meals that you want to receive. It should also be possible to tailor the service as you go along. So, as you learned more about the service, you could adjust your preferences to ensure the meals are exactly right. Because the meals are prepared individually they should be fairly close to homemade dinners. California Chef Services customizes meals for customers, which includes the ability to have gluten-free meals. The style of California Chef Services is amazing. But, it’s easily one of the most expensive companies out there. Dinners start at $25 each and are $28 if you want them to be organic. The cost per meal decreases if you want multiple each day but they still end up expensive. That’s a lot of money for dinner – especially when it’s a meal that you reheat. For most people, the meals wouldn’t be worth the cost. But, the style is perfect if you have multiple dietary restrictions, especially if some of them are unusual. You might find other services that cater for those but none will offer the level of flexibility that California Chef Services does. The meals are delivered fresh to anyone in the greater Los Angeles area only. They include heating instructions and the company uses disposable containers. Sakara is a plant-based gluten-free option. Actually, the company specializes in food that is gluten-free, dairy-free, non-GMO, and free from all refined sugars. There is also a strong emphasis on greens and you’ll often see four cups or more of greens per meal. Most meals contain some raw and some cooked ingredients, and many can be eaten chilled. The general focus of the company is on nutrients and on clean eating. As a result, the meals are more nutrient-dense than what most other companies offer. They even manage to contain a decent amount of protein. Many of the meals are bright and vibrant on the plate as well, making them extremely appealing. The meals from Sakara are plant-based and free from many allergens, including gluten and dairy. The main way to order is through a weekly subscription. This is the company’s Live It program and gives you breakfast, lunch and/or dinner for either three or five days each week. The exact options and pricing varies depending on your location and Sakara isn’t open with this information. However, the site states that the three-day plan costs $239, while the five-day one costs $420. Those prices seem to be for all three meals, although the site isn’t clear. On a side note, the program also comes with various beverages. For example, ordering all meals would give you Beauty Water, Detox Tea, and Detox Water, in addition to the meals that you had ordered. Whether this is appealing or not will depend on your views about detox drinks. But, if nothing else, it is an unusual idea. All-in-all, Sakara is expensive but it has merits. It’s easy to see how it would be appealing if you’re focused on clean eating. Few other companies include so many greens in their dishes and also contain some raw ingredients. So, for some people, Sakara could work well. Thistle is an interesting option for health. The meals strongly rely on plants, giving your more greens than many other companies (except Sakara, of course). But, there are still options for meat lovers, as you can choose between plant-based protein and meat for your meals. All meals are gluten-free and dairy-free, while including many different superfoods. Thistle has a strong emphasis on plants and superfoods, although you can include meat with your meals too. Thistle is limited to California and to some parts of Nevada. They offer local delivery to a relatively small area, including San Francisco Bay, Los Angeles, San Diego and Orange County. People in these locations can choose meals for three, four, five or six days, while also selecting various meals and snacks. People in other delivery areas have a more limited selection, which includes just two plans, one for six meals and the other for nine. Thistle provides pricing information as you step through the ordering process. But, as always, the price per meal decreases with larger order sizes. The price also depends on physical location. But, the highest possible prices are $15.99 per meal for meat and $13.99 for vegan. This can get as low as $12 for meat and $10 for vegan. Unless you’re getting one of the larger plans, the prices are on the expensive side. But, the food from Thistle does look amazing and it is fresher than many other companies. The style is also great if you want more plants in your diet. Veestro is a plant-based company, with all meals being vegan, organic, and free from preservatives. Veestro doesn’t specialize in gluten-free meals but they do have a gluten-free plan. They state that they take every precaution possible to avoid cross-contamination. But, as always, if you are highly sensitive to gluten, you should choose a company that only offers gluten-free meals. Veestro offers a variety of different options, including various meal packs. Most of these packs are one-time orders only. These vary in size, but most contain 24 – 25 meals, or more. The pricing starts at either $8 or $9 per meal, although it can vary depending on the options you select. Veestro has a gluten-free plan and many of their A la Carte meals are gluten-free too. One of the meal packs is specifically gluten-free. This one offers 24 meals for a total of $229. You can order it on automatic delivery (for a 5% discount) or as a one-time order. The menu is provided on the site and you get no control over the meals. Veestro also states that they will make substitutions as they need to, based on what is available. Most of the other meal packs also contain a gluten-free option, giving you no shortage of variety. Many of the meals in Veestro’s A la Carte menu are gluten-free as well. The prices typically vary between $10.99 and $12.99, depending on the meal in question. But, the site doesn’t manage these well. There are no labels showing which dishes are gluten-free and no way to filter for gluten-free meals. Instead, the information is only provided in the product descriptions, which is frustrating. All of the meals from Veestro come frozen, not fresh. If you order the large meal packs, you typically get all of the meals in one go. These can be stored in the freezer for up to eight weeks, so they’re great for stocking up your supply. But, this style isn’t as appealing if you’re hoping to have meals every night. Beetnik is another company that offers frozen rather than fresh meals. Their meals can actually be found in physical stores as well as online. Despite this, Beetnik maintains a strong focus on quality and on sustainable ingredients. All of their meals are USDA certified organic, GMO-free, and gluten-free. They also focus on humanely-raised chicken and beef. Their main range includes 18 different frozen meals. They all use either chicken or beef as their primary source of protein. The meals can be purchased individually, each costing $7.99 through the site. The service does also offer a small range of pasta sauces (for $8.99) and some meatballs (for $9.99) – but that’s it in terms of selection. Beetnik offers 18 different frozen meals that you can order individually or in bulk. The pricing is one of the largest advantages with Beetnik. Most of the organic meal companies that we’ve found charge much more for their products. Many non-organic ones are more expensive as well. This makes Beetnik perfect if you’re looking for fast and easy meals. You can get lower prices again if you buy through a Value Pack or a Variety Pack. The Value Packs provide eight meals of a single type for $59.99 (around $7.50 per meal). The Paleo Variety Pack offers 11 paleo meals for $84.95 (around $7.70 per meal). Finally, the Whole30 Variety Pack offers eight Whole30 meals for $62.99 (around $7.90 per meal. You don’t save a large amount with these. But, the prices were already so low that this doesn’t matter too much. You’re still paying much more than a cheap frozen meal from the grocery store – but the products from Beetnik would be much healthier and they certainly use better ingredients. The name Paleo Diet Delivered gives away a lot about this company. Like other paleo companies, Paleo Diet Delivers focuses on the principles of the paleo diet. These include meals that are gluten-free, dairy-free, and natural. Some other ingredients are avoided as well, including grains, pseudo grains, and legumes. Paleo Diet Delivered does have an emphasis on sustainably sourced and natural ingredients as well. But, there are few details about what this means or where the ingredients come from. The produce doesn’t even appear to be organic, which is unusual for paleo. All the meals from Paleo Diet Delivered are gluten-free, although they are on the expensive side. The company offers style-based meal plans. For example, their poultry-based plan offers meals like Paleo BBQ Chicken with Broccoli and Red Peppers, Paleo Chipotle Chicken with Grilled Vegetables, and Paleo Thai Sweet Chili Chicken with Mixed Asian Greens. There are similar menus for pork, chili, fish, and burgers. Most of their dishes cost $16.95 each and there are also juices available, which cost $12.95 per glass. This pricing is the biggest issue. The food does look and sound good – but it’s not organic and isn’t that amazing. The company is also vague about many important areas, including where their ingredients are sourced from. With so many other gluten-free companies out there, this one just doesn’t seem worth the time. MamaSezz is a vegan company that offers plant-based food. Their meals are also gluten-free and organic, and the company uses no refined sugar, no oil, no GMOs, and no preservatives. All meals are delivered fresh, which helps ensure their quality and taste. The company has a limited selection of meals, although they do also offer various sauces, sides, and snacks to choose from. Their dinners are mostly $15.99 each, which is higher than many other companies. However, these are family-sized and typically offer three servings. This makes them perfect if you are feeding more than one. MamaSezz offers larger meals than normal and all their food is gluten-free. You can also order items in a themed bundle. Most bundles cost either $89 or $99. They can be ordered individually or on a subscription. Some of the options include their Family Bundle, Get Me Started Bundle, Lunch Box Bundle, and Just For Me Bundle. Each offers a selection of meals and is cheaper than ordering those same meals individually. The company has three different shipping zones and charges different rates depending on where you are. Details about these zones are provided on their site. In all cases, the shipping fee becomes cheaper once you spend $89 or more on a single order. If you live close enough to the company, shipping is even free at this point. FoodFlo is an organic, alkaline, and vegan meal company that serves the majority of Los Angeles County and Orange County, along with some nearby areas. The meals are all gluten-free as well, while tending to be raw. This style creates a strong focus on plants and plant-based nutrients, making the meals extremely healthy. As the company points out, you don’t have to be vegan to eat their meals. You could easily pair them with meat instead to give yourself a more filling dinner that is still balanced. FoodFlo offers alkaline, raw, and gluten-free vegan meals but the ordering options are extremely limited. The biggest limitation with FoodFlo has to be the ordering. You can choose between FoodFlo One Week Delivery for $139 or FoodFlo Four Week Delivery for $499. These can be ordered as one-off sets or as a recurring order. Regardless, of what you choose, you receive one soup, two side salads, four entrees, four side dishes and four snack bars per week. The company estimates that the food will provide you enough for five days – and it also lasts around that length of time. If this fits in with your lifestyle, great. But, there’s no flexibility. You can’t change how many meals you get per day or per week. You have no control over the actual food either. This aspect is more common and means you’ll get whatever is on the menu each week. You can make allergy requests and the company does their best to honor them. But, the vegan and gluten-free nature of the diet means that many are already covered. Kitchen Verde serves the Rochester, New York area and delivers to anywhere in Munroe County. Their meals are entirely plant-based, making them suitable for vegetarians and vegans. The company isn’t completely gluten-free. Even so, most of their meals are and they follow correct procedures to prevent cross-contamination. An interesting aspect is how you order. Kitchen Verde offers a menu that changes weekly. It includes a range of items, including breakfast, lunch, and dinners, along with various snacks, desserts, and other items. Brief details are provided about the dishes, including nutritional information. But, there is no meal plan associated with the menu. Kitchen Verde has a limited selection and only delivers to Munroe County. But, their meals are appealing and inexpensive. Instead, items are individually priced and you simply add them to your cart. There is no minimum order size and shipping costs $5 regardless of your order. You can also pick up the meals for free if you would rather do that. In the current menu, breakfasts cost $7, while lunch/dinner meals range from $9 to $10. Other items vary in price, such as desserts for around $6 and juices for $9. These prices are reasonable and are lower than many other companies. The style has many advantages and gives you complete control over the meals you receive. The main limitation is selection. Each week there are around seven or so lunch/dinner meals to choose from and they’re not all gluten-free. This could be frustrating if you wanted meals for most nights of the week or if you wanted lunches and dinners each day. The main specialization of NutriFit is flexibility. Many prepared meal services are rigid in their options and their meals are often made before you even order them. NutriFit allows members to almost completely customize their meal plans. This includes both small and large changes. One aspect of this is gluten-free meals. The best way to look at NutriFit is to consider their two general plans: Essentials and Premium. Essentials is less expensive but has limited control. Premium allows you to fully customize ingredients and make more decisions about the plan as a whole. The Premium plan also offers gluten-free meals, while the Essentials plan does not. NutriFit can be a little frustrating to use but it does offer more flexibility than many other companies. Basic pricing for the Premium plan varies depending on how you pay. If you have a 28-day plan with them, then breakfast costs $17.95, lunch costs $18.95 and dinner costs $28.95. That’s for the meals individually. There are also combinations, like breakfast, lunch, and dinner for $54.95 per day. You can also pay daily, which is more expensive. These prices are definitely on the high side. They’re also just standard prices. The amount you actually pay might end up being higher or lower, depending on your specifications. To be honest, the company doesn’t feel worth it. There are few specifics and even fewer images of the actual meals. It’s also unusual to find gluten-free considered a premium option. Many of the other services on this list include it automatically. Paleta is another good company for flexibility. They have a focus on farm to table meals, resulting in high-quality ingredients and interesting dishes. The service isn’t entirely gluten-free but there are multiple gluten-free options included. The first is a paleo/gluten-free meal plan. The name is slightly misleading, as the plan is actually paleo inspired. Even so, it is entirely gluten-free. The menu allows you to choose the size of your meals, including 1,200 calorie, 1,600 calorie, and 2,200 calorie options. The prices are $49, $59 and $69 per day for each of these, which includes meals for an entire day. You can also decrease how many meals you get daily but there aren’t many details about the pricing for doing so. Paleta has multiple plans and styles – and most have a gluten-free option. There is also a personal chef option. This one starts at $149 per day with a ten-day minimum. This is an expensive service – but it allows you to customize absolutely everything. For some situations, this would be an amazing service. Finally, there is a cleanse. This is designed as a short-term way to detox the body and potentially increase weight loss. While it isn’t something you would want to do week in and week out, the cleanse does remove all gluten, along with other problematic ingredients. It might be a good starting point, especially if you’re new to gluten-free meals. The overall style of Paleta works well. The biggest problem is that it’s difficult to know exactly how much you’re paying. The meals do seem to be more expensive than other services, although the prices would depend on your plan and preferences. It’s also not clear how much control you get over the meals that you receive. Kitava is a little different than most items on the list. First and foremost, Kitava is a restaurant, on Mission Street, San Francisco. They also operate a food delivery service throughout San Francisco, using companies like GrubHub, DoorDash, and UberEats. This means you end up with restaurant-quality food that is incredibly fresh and made to order. Kitava also has a comprehensive food philosophy. This includes relying on healthy fats and oils, while cooking from scratch without using additives and fillers. Ingredients are sustainable and locally sourced, wherever possible. All meals are gluten-free and dairy-free. Kitava gives you the chance to get restaurant-quality meals delivered quickly to your home. Because of this style, you simply order meals as you want them. The selection is similar to a conventional restaurant, so it isn’t huge. But, there is the ability to mix and match proteins and sides, which gives you some more options. Most full meals are between $13 and $16, although ones containing wild-caught salmon are a little more expensive. There are also some small plates and salads, along with chicken bone broth, desserts, and cold drinks. Kitava may not be the best option if you want a meal ready for you every night. But, the company is just as convenient as takeout and is much healthier. Veggie Vibes is a powerful choice for plant-based nutrition. The company actually offers vegan, raw, and organic meals – so they automatically meet many dietary needs. The dishes are all free from dairy, gluten, and soy as well, along with any artificial and highly processed ingredients. Because of this, the food is highly nutritious and tends to look amazing. Because the meals are raw, you can actually eat them cold, without needing to heat them at all. Alternatively, they can be warmed or cooked, based on your preferences. Veggie Vibes is located in San Diego County and delivers food locally once per week. But, they also ship overnight across the United States. Veggie Vibes offers multiple interesting meal plans and some very unusual meals. They currently have four different meal plans to choose from. The first three of these are called Alive, Reset Cleanse, and Savory Raw. In each case, you get a combination of meals and various styles of food. For example, lunch could be an entrée or a salad, while dinner might be an entrée or a soup. Various snacks are also included. The plans allow you to choose between subscription and a one-time order – along with whether you want meals for three, five, or seven days. The price varies between each of these options and depends on the plan in question as well. For example, the Alive plan offers breakfast, lunch, and dinner. On subscription, it costs $163 per week for three-day, $254 for five-day, and $336 for seven-day. The prices aren’t exceptionally high when you consider the amount of food and the quality. Veggie Vibes also provides many details about what you can expect, which is a great feature. There is one final plan, called Your Selection. With this, the three-day option gives you 12 food items (for $163/week). The five-day gives you 20 items (for $254/week) and the seven-day gives you 28 items (for $336/week). You get complete control over the type of items and the individual products. This is based on the weekly menu, so you have to choose each week. But, if you don’t mind the work and the extra price, this is a powerful option for providing choice. Sunfare itself isn’t a gluten-free company. But, it does have multiple meal plans and one of these is paleo. The nature of paleo means that any paleo menu will be gluten-free. Likewise, the meals avoid grains, legumes, dairy, processed oils, refined sugars, and potatoes. Portion sizes are fixed on this plan and the company uses a rotating menu. However, you can choose alternate meals on any day. This means you can have as much control over your food as you want. Or, you can sit back and let Sunfare select for you. The company even lets you provide feedback on meals, helping to ensure you get meals that you actually enjoy. The meals themselves aren’t the most amazing that I’ve seen but their paleo selections still manage to be interesting. Examples include Seared Duck Breast as a dinner and an American Omelet for lunch. Sunfare has a paleo menu and all meals in that will also be gluten-free. The plan costs $49.95 per day or you can pay $54.95 per day for their Fit Plus plan. That one has the same menu items but offers larger servings and is perfect for athletes. In either case, a day includes breakfast, lunch, and dinner, along with two generous snacks. The catch is that you have to pay in advance. That totals to $999.00 for the 20-day version of their regular plan and $1,398.60 for the 28-day. Those prices are $1,099.00 and $1,538.60 for the Fit Plus version. The average per day is nice but this is a lot of money to pay up-front. You can also order weekly. The meals cost more when you do so but you’re not paying up front. There is also more flexibility. With weekly ordering, you can choose which meals you want on which days. For example, you might have dinner every day but only have breakfast and lunch on the weekends. However, there is a $24.95 minimum order size per day. As the name suggests, The Vegan Garden focuses on vegan meals. This includes a heavy reliance on plants and on fresh ingredients. Unusually, the meals here aren’t organic and they are shipped frozen, not fresh. The company is different than most, as they offer many different independent packages and plans. Each of these is distinct and the styles vary from one to the next. Now, The Vegan Garden itself isn’t gluten-free and most of their options aren’t either. But, there are enough gluten-free alternatives to earn the company a place in this list. The Vegan Garden isn't fully gluten-free but they do have some gluten-free options. The first option is the company’s Gluten Free Pioneer Meal Deal. This costs $295 and comes with meals for a full week. You get breakfast, lunch, dinner, and dessert for every day. There is a sample menu provided but you might get different meals. You also can't change anything. There is also a Customized Meal Plan that provides 28 items a week for $550 a month, and a U Pick-Em Plan, which gives you 28 items total for $199 per month. In both cases, you choose from the A la Carte menu. That menu has a separate gluten-free section that contains various meals, snacks and desserts. It isn’t the most extensive gluten-free menu out there, but the selection might be perfect for some people. It’s also worth mentioning that the Customized Meal Plan ends up being unusually cheap. If the pricing on the site is accurate, it calculates out to around $5 an item. Some of those items are smoothies and desserts – but it’s still a low price for a month’s worth of meals. Muscle Meals 2 Go is performance-based and it isn’t really a gluten-free company. We’re including them in the list because all of the meals come with a gluten-free option, you simply select it during checkout. The meals provided are designed to be balanced and include lean protein, complex carbs and vegetables (you can also choose all veggies instead of veggies and carbs, for an extra fee). The meals are also high in protein, which should make them filling. Muscle Meals 2 Go has various meals to choose from and they all have a gluten-free option. The company offers three different styles of plan: Lean (for weight loss), Maintain (for fitness), and Gain (for muscle gain). Despite this, there are only two types of meals and two main ordering options. You can simply order plans that have meals that contain 3 oz of protein or meals with 6 oz of protein. In each case, you can get 12, 18, or 24 meals per week. For the 3 oz option, the prices are $99, $144, and $180, respectively. For the 6 oz option, the prices are $123, $180, and $234. These average out to between $7.50 and $8.50 per meal for the 3 oz and between $9.75 and $10.25 for the 6 oz. Even at the most expensive levels, these prices are very competitive. There is a surprising amount of flexibility too. For example, you can specify whether you have gluten, lactose, and/or nut allergies. You can also choose to add on breakfast and snacks to your order, if you want to. You can even choose the specific meals that you want to receive. The main limitation is that there are few images of the meals and there are no descriptions. You have to rely on the title and the limited nutritional information. Because Pete’s Paleo is paleo, you don’t have to worry about choosing the right meals or selecting the correct box during checkout. Instead, all of the meals are gluten-free. The company is also a fascinating one. They rely on organic and seasonal produce – basing the entire menu around it. As a result, the meals change from week-to-week, based on what is currently being harvested. The dishes are also chef prepared and you end up with meals like Braised Pork Shoulder with Roasted Parsnips and Roasted Broccoli or Sage Grass-Fed Short Ribs with Roasted Sweet Potatoes and Garlic Broccoli. Pete's Paleo focuses on seasonal food, with all meals being paleo and gluten-free. There are five main options for ordering. You can get 5, 10, or 14 meals at a time. Alternatively, you can go with vegetarian (10 meals only) or family meals (5 meals, 4 servings each). Most selections come with other options too, like the chance to double protein or to add on extra sides. As for prices, you pay $123 for 5 meals ($24.60 per meal), $189 for 10 meals ($18.90 per meal), or $249 for 14 meals ($17.80 per meal). The family plan costs $324 ($64.80 per meal), while the vegetarian one costs $129 ($12.90 per meal). Aside from the vegetarian option, these are all expensive. But, if you’re looking for high-quality food the company does make sense. TrueFare once went by the name Pre-Made Paleo and it continues to be a paleo company. All of the meals are Whole30 approved as well, while many can be used on a keto or an AIP diet. As a result, all of the TrueFare meals are also gluten-free and you don’t need to worry about cross-contamination. Meals rely on healthy and natural ingredients. These include sustainably sourced protein and organic produce. Regular meals range from 350 to 500 calories per serving and normally contain a protein entrée, along with six ounces of vegetables. There are also Warrior meals that are higher in calories and are designed for active people. TrueFare has various meal plans to choose from, but you don't get to pick your individual meals. The overall style with TrueFare is that you order from various menus and meal plans. For example, there is an AIP 5 Day Whole30 plan that starts at $175, a 10 Day starting at $325 and a 20 day starting at $640. Each of those offers three meals per day. Other plans are for dinner only or just for a set number of meals. For example, a 40 meals subscription simply contains 40 meals and costs $510. You can order that weekly or every two weeks. There is very little flexibility within the plans. Some have options like Warrior portions or specific sources of protein, although you normally pay extra for these. You can also make requests, such as avoiding red meat or changing the frequency of meals. The plans don’t give you control over your meals. Instead, the menu changes from week-to-week and the chef picks exactly what you receive. Many plans give you two of each meal, which limits the variety. But, on the plus side, the pricing is reasonable. Most plans work out somewhere between $12 and $15 per meal, depending on what you choose. These aren’t the cheapest meals on this list but the price is pretty good for the quality that you get. As a paleo company, Caveman Chefs is a great option for gluten-free meals. Like similar companies, they do focus on sustainable ingredients, including organic and seasonal vegetables, and sustainably sourced protein. But, the company is also a little different. With so many gluten-free options out there, that’s definitely a good thing. The most significant aspect is the types of meals. You can choose between Medium (550 calories – for $13.75 per meal), Large (650 calories – for $16.25 per meal), and XL (750 calories – for $18.75 per meal). You can order six meals or ten meals every week. In every case, payment is monthly. The totals range from $330 to $750 per month, depending on the plan you go with. That’s not all. There is a second set of meals, called Dinners by the Pound. These have ½ Pound, ¾ Pound, and 1 Pound options. The ½ Pound has ½ lb of protein and 1 lb of vegetables. It costs $365 per month for three meals a week and $610 a month for five meals a week. The prices go up from there. Caveman Chefs has one of the most comprehensive selections of meal sizes, giving you plenty of versatility. The idea would work well for anyone who finds that regular delivered meals just aren’t satisfying. The smallest meals are 550 calories and the largest are 2,600 calories, so there is something for everyone. You can also specify allergies and dietary preferences. Images of some meals are provided too and they look appealing. The main limitation is choice. You don’t seem to get any control over the meals that you receive. There is also little information about what these will be. This could be frustrating if you wanted to plan meals or if you enjoy some types of meal more than others. One Paleo Delivers is a local company, just serving the area of Southern California. To people within this area, they provide a reliable paleo meal delivery service, with meals that are free from gluten, grains, dairy, beans, and refined sugars. There are also many customization options. For example, you can specify up to six different allergies or food dislikes during the checkout process. You can also opt for Whole30 meals if you like. Other choices include adding on extra protein and choosing the portion size. One Paleo Delivers provides paleo meals daily, if you live in Southern California. Meals are delivered each day, except Sunday (Sunday’s meals are delivered on Saturday). This gives you much fresher food than if you received all of your meals in one go. The meals aren’t boring either. One Paleo Delivers seems to experiment with styles and flavors, so you’ll always get something tasty. There are two ordering styles. One gives you three meals and two snacks each day (starting at $55 per day). The other gives you two meals and one snack per day (starting at $40 per day). You can choose which days you want delivery and the duration of your program. Possible durations are anywhere from 5 to 60 days, with the longer versions offering more discounts. However, there are two main limitations. First, there isn’t much ability to select meals. It seems like you can make some choices after you purchase but this is based on the current menu. This also means you need to pay before you can see the meals that you’ll be getting. Second, the smallest plan is for two meals (and one snack) each day. That may be more food that you want. Once again, Grandcestors is a paleo company, which automatically makes it a good gluten-free choice. There is also a strong focus on quality and the idea of relying on whole food – not processed ingredients. In this case, all of the meals are already prepared and you simply order the ones you like. There are seven different ones to choose from including Colorado Hash, Cottage Pie, Grumbo, and Chicken Tikka Masala. The details about each meal are provided on the site, along with nutritional information. Grandcestors offers frozen paleo dinners – and just has seven different meals. Grandcestors doesn’t offer any type of menu or plan. Instead, you pay $9.99 per meal. You get a 10% discount if you order 25 meals or more. You do pay for shipping as well and this is based on where you are and how much you order. All of the meals are frozen and can simply be reheated when you’re ready to use them. Because the meals are already prepared, you can’t make any requests or changes. With only seven meals to choose from, Grandcestors isn’t the most practical company if you want weekly dinners. They’re also relatively expensive for frozen meals. But, this would still be a good way to stock up your freezer. By doing so, you’d always have healthy and hearty meals on hand. Paleo Meals to Go has some similarities to Grancestors, along with key differences. Like Grandcestors, this company offers pre-prepared meals that you order individually. They are also gluten-free, paleo, and milk-free (they don’t claim to be dairy-free). The biggest difference is that all of the meals here are freeze-dried. They come in sealed bags and are designed for emergency kits, camping, and similar situations. There are 16 total products to choose from, although only around half of these are meals. The rest are snacks. Paleo Meals to Go offers freeze dried meals and snacks. The meals go for $13 at full price, although they are sometimes on sale for $11 each. The style does mean they’ll last and they’re also shelf-stable. The meals probably won’t suit at all if you want weekly dinners. But, there aren’t many gluten-free freeze-dried meals out there and these would be relevant to some people and situations. Each of the meals is somewhere between 320 and 360 calories, and nutritional details are included. Meals tend to be high in protein as well and they get good reviews. The website also provides an ingredients list and nutrition facts, along with preparation instructions. This gives you all the details you need before you order anything. Vegin’ Out is a vegan company and it isn’t specifically gluten-free. However, there is a gluten-free option for all of the meals provided. This allows you to choose anything you like from the company. The one exception is their homemade cookies, as Vegin’ Out does not have a gluten-free recipe for these. The method for ordering is unusual. Vegin’ Out basically just provides one package. This contains three different entrées in a 24 oz container, four sides in a 16 oz container, one soup in a 32 oz container and five individual cookies. What these consist of varies week to week depending on the menu. Vegin' Out offers a package of meals that you have little control over. But, the food is interesting and there are gluten-free options. If you order a Single Meal Delivery, you get what is described above. You can also order a Double Meal Delivery, which gives you twice as much. You can also add on individual entrées (for $13), sides (for $11), dressings (for $0.50), and cookies (for $6). But, that’s all the control you have over order size. You can’t decrease the number of meals or change the proportions. The price for each option varies depending on where you are. The Single Meal Delivery costs $127.99 in Los Angeles, $145.99 in Southern California, Northern California, or Arizona, and $189.99 elsewhere in the United States. The Double Meal Delivery costs $234.99, $259.99, and, $360.98 for the same areas. The price differences are substantial, making Vegin’ Out best for those who live in Los Angeles. You can also make other requests about allergens, using their special requests box. You can also substitute one meal for another, although it’s not clear how you do this. To be honest, the company makes itself much more confusing than it needs to be. That’s never a good sign.